Each time you have a checkup, ask your doctor if it is okay for you to drive. To reduce the risk of injuries to both you and your unborn child that can be caused by an inflating front airbag: • When driving, sit upright and adjust the seat as far back as possible while allowing full control of the vehicle. 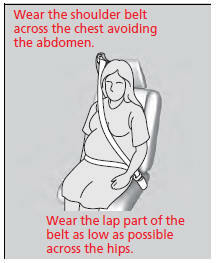 • When sitting in the front passenger's seat, adjust the seat as far back as possible.